Hair color and hair styles are what we must consider when buy human hair wigs. Do you know how to choose color when you deside to wear human hair full lace wig or lace front wig?Choosing wouderful hair color for your skin color can make you ourstanding. Pick the hair color that match your personality, lifestyle and your place in life ,so you will never feel being disappointed. Know the important rule of hair color before you buy a full lace wig or lace front wig. The rule is: natural hair color plus the shade of the color you choose equals your new hair color. For example, a light blond natural color plus auburn colorant equals strawberry blond hair. On home hair color matching, there is a guide that shows you an idea of what your hair color might look like in the end. Choose the type of your full lace wig or lace front wig hair color. Hair color come in two basic types: permanent and temporary. For people unsure about a new hair color, temporary hair color is the way to go,temporary hair color means virgin natural color that hasn't been dyed by factory or hair salon,and you can dye the hair when you want to change new looking . 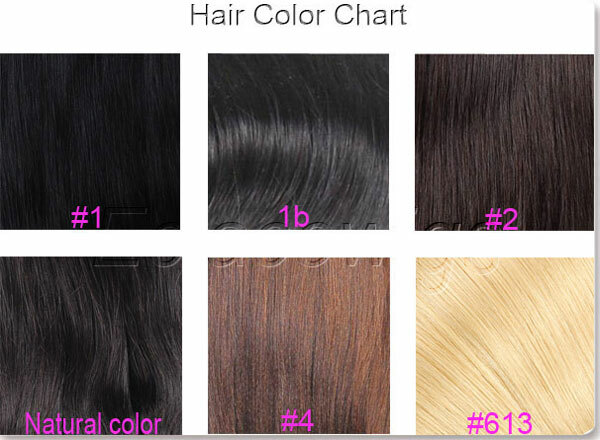 Permanent hair color is for those who are ready to commit to a hair color,such hair colors were dyed by factory,and it is not natural hair color,the color were dyed into cuticle and can't be dyed again,so once you choosed the color you like,you can't change wigs color any more. Choose a color that complements your skin tone. The two basic types of skin tone are cool and warm. Cool-toned people have blue, green, gray and hazel eye colors. Their skin tones are olive, rosy, fair or rosy brown. Cool-toned people need to stay away from colors like gold, yellow, red or bronze. People with warm-toned skin have fair to medium brown or darker eye colors with brown and black hair. Warm-toned people need to choose hair colors that are rich browns, auburns, reds or golden browns. Decide if you want highlights or streak highlights or not. Highlights and streak highlight come in all color.if you buy from our site,we can add any color highlight you like in one or two days,but a little extra cost will be added to your total amount.highlight looks very fashionable.